May 24, 2016: This article has been revised to reflect an inconsistency in my handling of Wheel Trans operating subsidies over the period. Specifically, up to 2009 I had included them in the total subsidy, but from then on, I had excluded them. This has been corrected and the WT subsidy is now shown as a separate component. 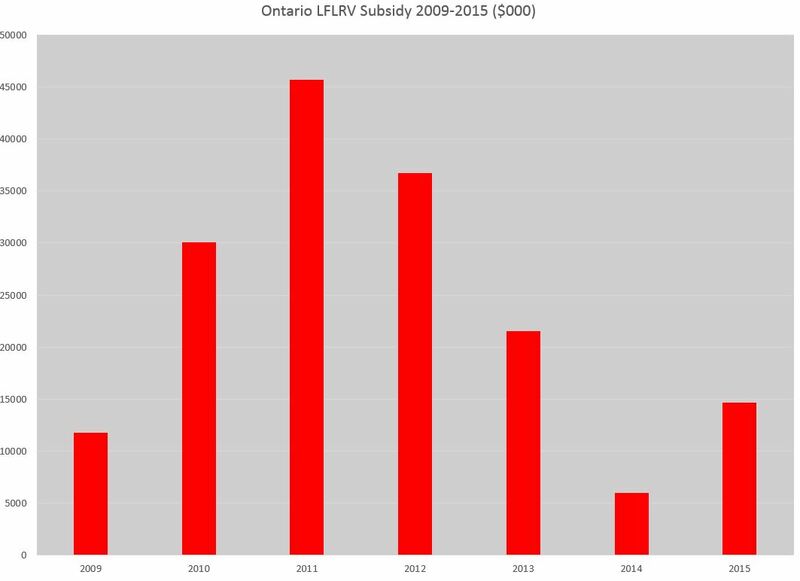 Also, a one-time provincial WT subsidy in 2008 has been included. In previous articles, I reviewed the details of TTC funding in the annual financial statements up to 2013. With the publication of the draft 2015 statement, it’s time for an update. This and other reports will be considered by the TTC’s Audit and Risk Management Committee on May 25, 2016. This analysis consolidates information from several parts of the notes to the financial statements and is presented in a different manner from those statements to simplify tracking by year and source of subsidies. Although the numbers all come from “official” sources, the arrangement and presentation is my own. In 2015, the City’s operating subsidy included a “capital from current” payment of $19.2 million that purchased 50 new buses. Although this was booked as an operating subsidy (for reasons shrouded in the mysteries of that year’s budget fiddling by the Mayor and Council), it is really a capital subsidy and I have counted it in that category for consistency. This one-time subsidy disappears in 2016, but this is not a “cut” in operating funding. The TTC’s operations are funded primarily through the farebox. In 2015, fare revenue contributed $1.109 billion while other sources (advertising, outside city services, rentals and miscellaneous) brought the grand total to $1.179 billion. The remaining $518.6 million was funded by the City of Toronto and Province of Ontario. 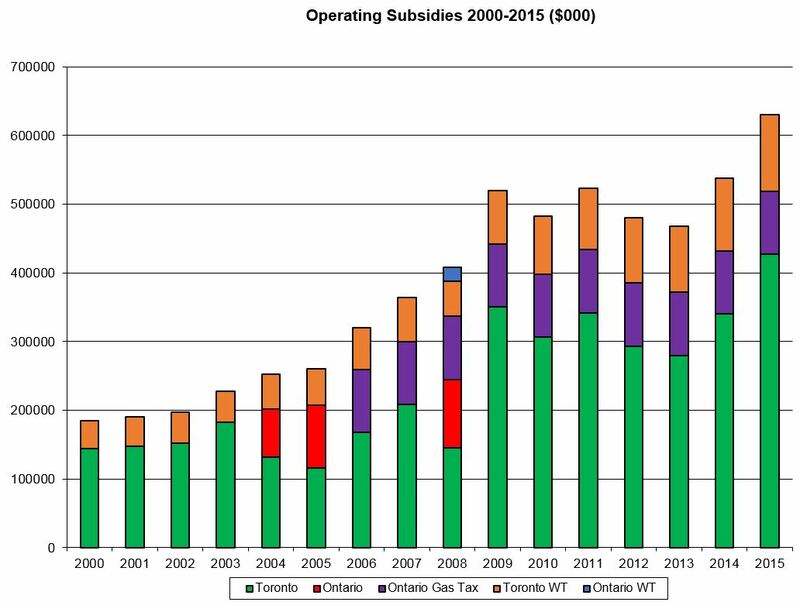 Over the years, Ontario subsidy has been paid primarily through a share of its Gas Tax revenue. Ontario transfers a lump sum to Toronto, and the City splits it between Operating and Capital budgets. The amount going to Operations has not changed for many years. 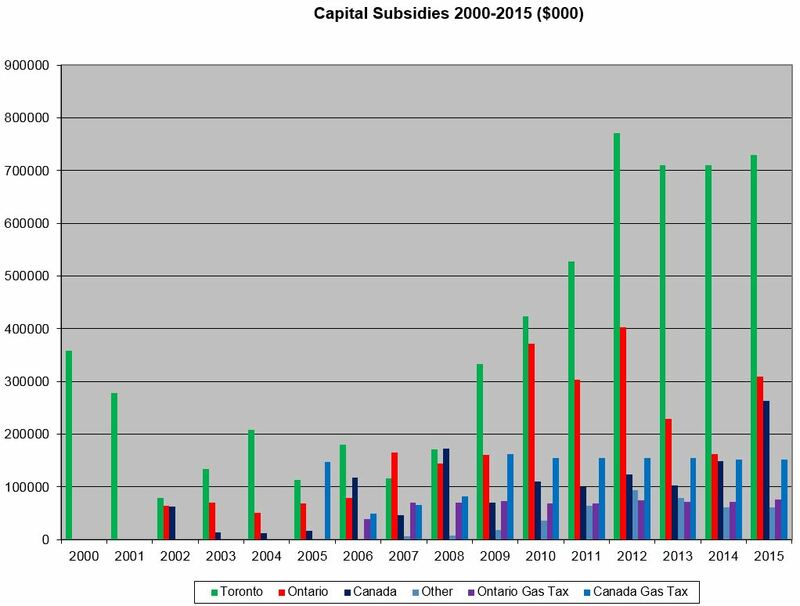 Ontario under the Harris government killed off all operating subsidies, and they did not return until 2004. The explicit link as a share of gas tax began in 2006, and a special subsidy was paid in 2008 because of the unusual financial circumstances of that year. The subsidies are presented in two formats below: total subsidy received, and individual sources. 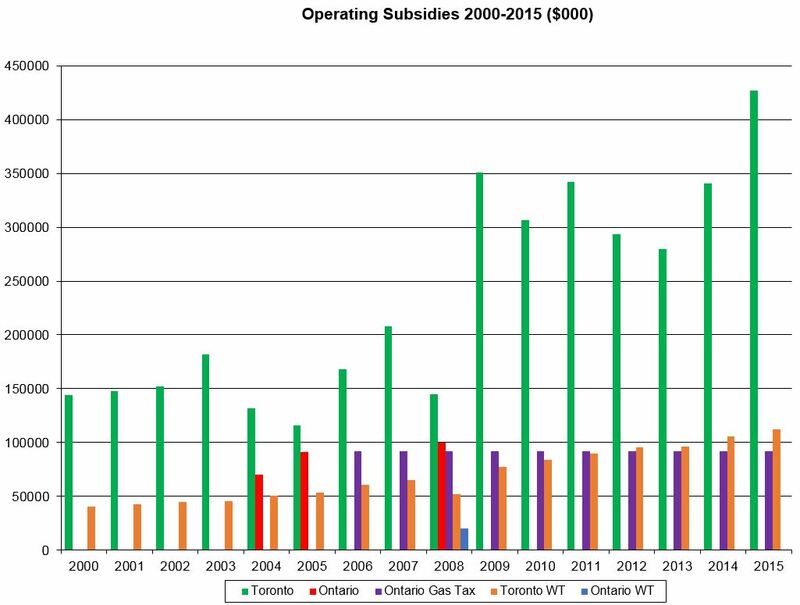 Either way, it is clear that the City of Toronto has carried the lion’s share of the operating subsidies. This is a far cry from the era when the City and Province split this cost 50-50. Over the 16-year period, the total paid by Toronto was $4.85 billion while Ontario paid only $1.20 billion. The chart below shows the components of the operating subsidy separately. 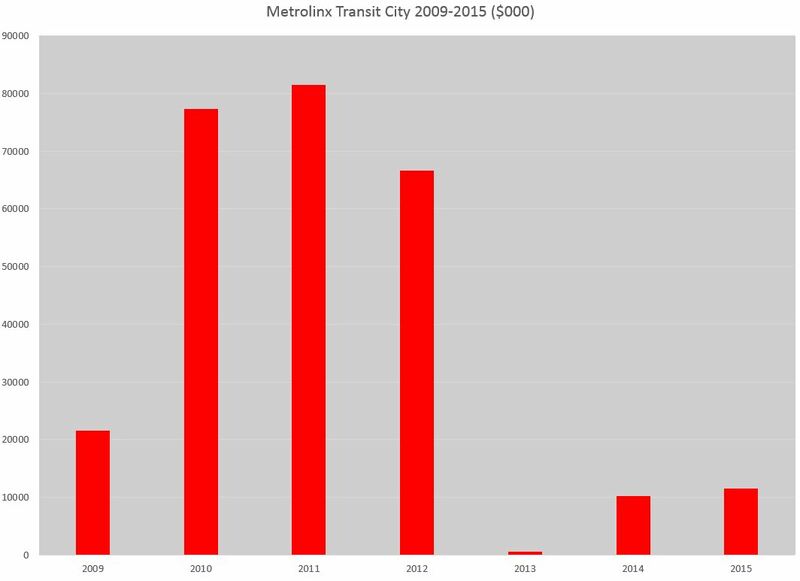 Except for 2008, the City’s funding of Wheel-Trans has grown, albeit slowly even when conventional service funding was cut back. The result is that the “conventional” cuts as a percentage are deeper than when the numbers are presented in aggregate. Capital subsidies pay for new projects such as the subway to Vaughan (aka “Toronto York Spadina Subway Extension” or “TYSSE”) and for replacement of worn out infrastructure and rolling stock. The money arrives in various ways depending on the political and financial situation when various programs and projects were launched. Some money, primarily gas tax, arrives on an annual basis. Some money comes from reserves that were funded through budget surpluses when times were good (generally before the 2008 financial meltdown). Some money comes from “commitments” by governments that are paid out as the projects they fund proceed. A large portion of the ongoing capital program is funded by the City of Toronto through a combination of current revenues and debt. In the first chart below, the total capital spending shows large growth over the past decade primarily due to the TYSSE project and major fleet updates. The gas tax contributions are broken out here to show how relatively small they are compared to other sources of funding. “Other” includes money from York Region for its share of the TYSSE and from Waterfront Toronto which is itself funded 1/3 by each level of government. The amounts here are only for spending through the TTC itself and do not include Metrolinx LRT projects within Toronto. The second chart presents the same data but with the sources broken into separate columns. This shows quite clearly the increased level of capital spending by the City of Toronto compared to other sources. 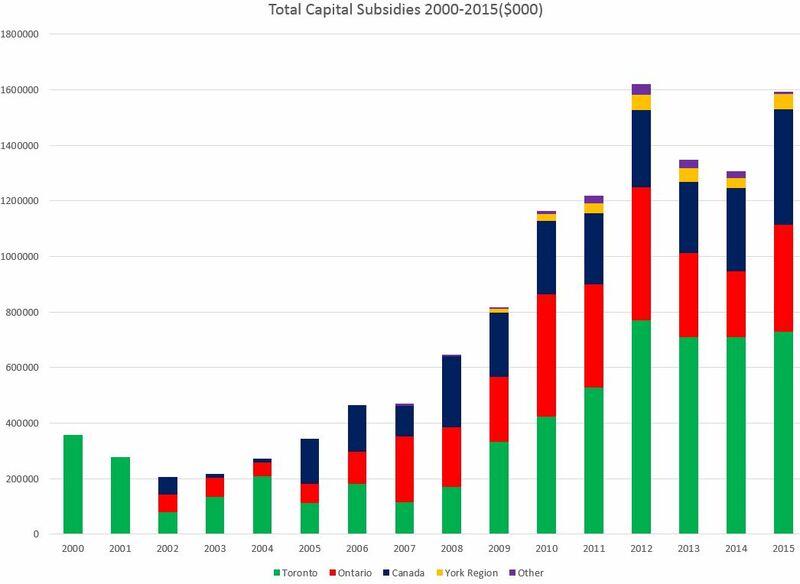 Over the 16-year period, about 47% of all capital funding has come from the City with most of the remainder split between Canada (23%) and Ontario (26%). 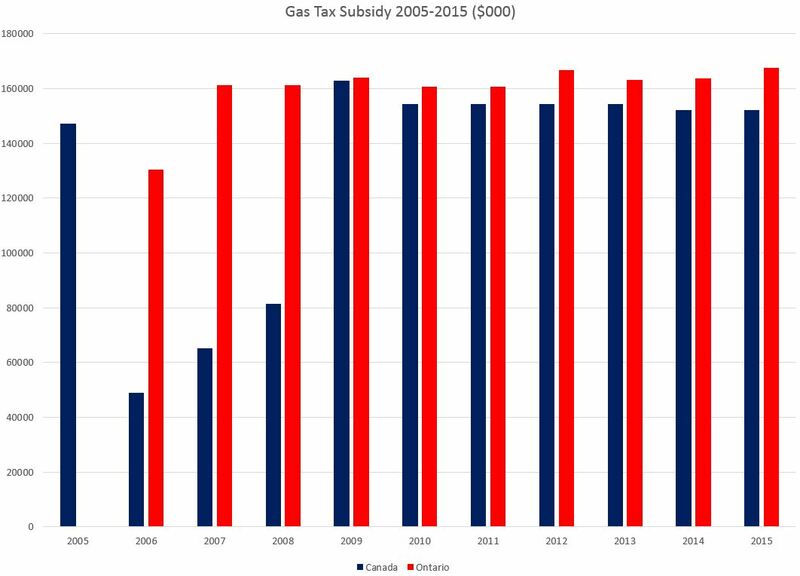 The third chart consolidates gas tax and other subsidies by government, and breaks out the York Region contribution for the TYSSE. Although we hear a lot about contributions from both levels of government through the gas tax, it is important to remember that the actual amounts have been almost flat for several years. In real dollar terms, the amount is declining thanks to inflation. Ontario’s gas tax is split between the Operating and Capital budgets at the City’s discretion. 2005 was a special year for federal contributions because it actually covered more than one year’s revenue. The federal contribution is pegged to Toronto’s share of the national population which has actually been declining. In both cases, the total amount available is based on cents-per-litre. This does not vary with the price of fuel, but it also is linked to actual fuel consumption. As a revenue source, this is not growing and could even be eroded by fuel efficiency, a shift to lower car ownership, and a move to untaxed fuels. When times are good, governments have surpluses burning a hole in their pocket that they cannot spend within the current fiscal year. To fix this “problem”, the money is transferred to a reserve usually with a name indicating how the money is to be used (and a political slogan showing how much they care about transit). During the mid-2000s, several funds were promised, but the cheques did not actually arrive until 2007-2008. Meanwhile, the TTC (actually Toronto on its behalf) spent money in anticipation of reimbursement from other governments. The 2008 financial crisis brought an end to this sort of funding, but many reserves had been created. These have mostly been depleted as of 2015. 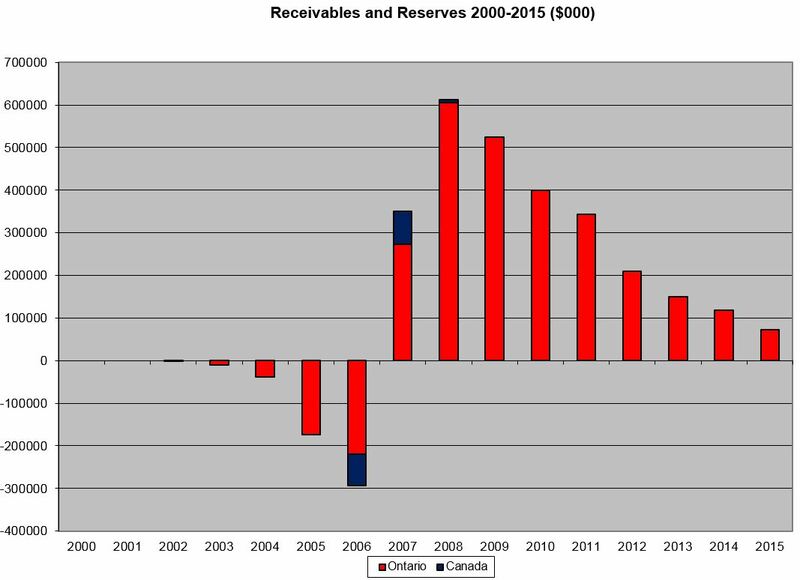 The charts below show the situation in aggregate, and broken down into separate reserves. CSIF: Canada Strategic Infrastructure Fund. Most of the money in this reserve has been spent, and the fund is supposed to wind down in March 2016, although an extension has been requested. PTCT: Public Transit Capital Trust. This federal program was short-lived and the reserve was depleted in 2008. ORSIF: This was an Ontario program to give the TTC money for rapid transit infrastructure outside of the standard subsidy channels as Toronto was the only city with this type of transit. 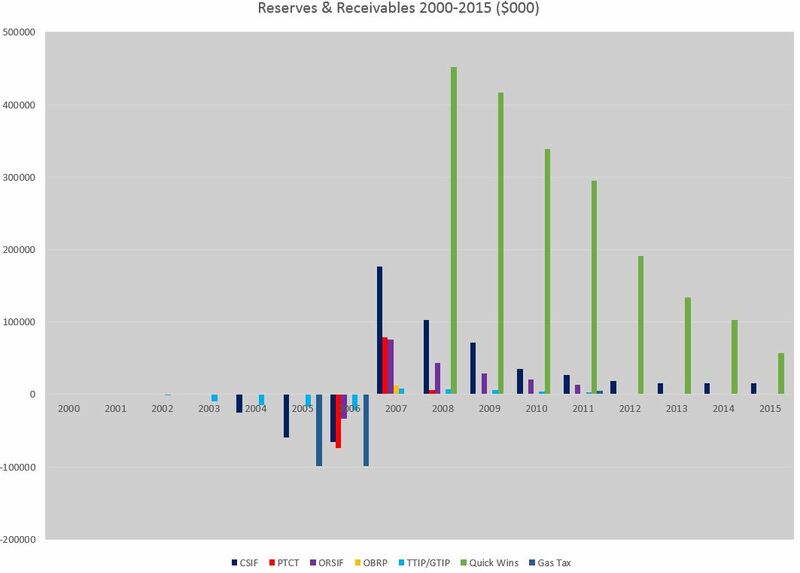 The reserve was depleted in 2011. OBRP: This was an Ontario program to fund bus replacements, but it no longer exists. Most of the funding came into and out of City accounts in the same year, and so little appears in the reserves. TTIP/GTIP: More discontinued Ontario programs for transit improvement. Like OBRP, little of the money stayed in City accounts long enough to show up in the reserves. Quick Wins: This is the 2010 Metrolinx program to fund various system improvements. The reserve will likely be depleted in 2016. Unless there is a major change in funding principles by Ontario and Canada, the use of reserves will likely disappear from transit budgets to be replaced by in-year funding either for specific projects (reimbursing spending as it occurs) or as block transfers (like the gas tax) for use by the City at its discretion. 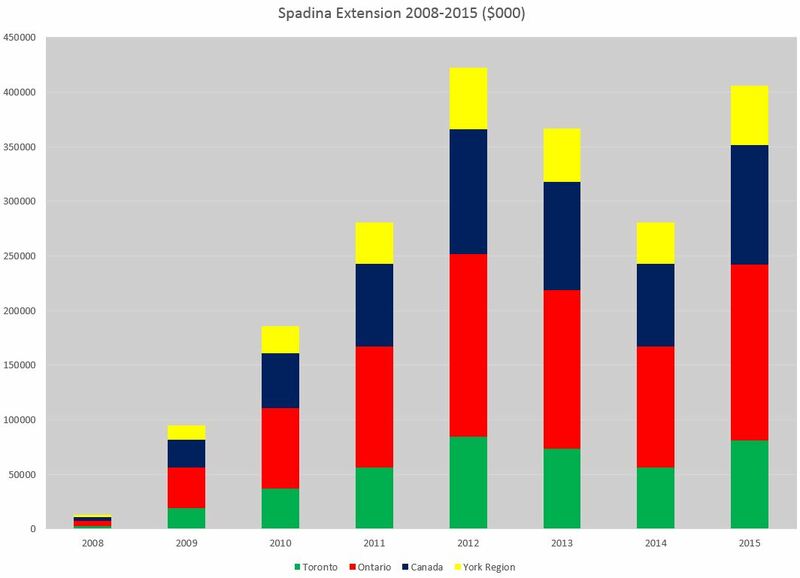 The Spadina extension to Vaughan is funded by Toronto, York Region, Ontario and Canada. To the end of 2015, the proportions contributed by each level of government have remained the same with only the total dollar amount moving up and down. From 2016 this will change as the cost overruns on this project will not be equally shared with the local municipalities on the hook for the extra spending. Metrolinx took over the Transit City projects from the TTC and reimbursed the City for its costs. Funding continues to show up in the financial statements because of work done on Metrolinx’ behalf by the TTC. Note that any clawback of sunk costs for the Scarborough LRT will require that some of this funding to be reimbursed to Ontario. The TTC is buying 204 new low floor streetcars from Bombardier with the cost subsidized 1/3 by Ontario. As is common in vehicle supply contracts, front-end loading funds the vendor’s startup costs and the remainder is paid out as vehicles are received and accepted. The lack of progress on this project is clear in the low levels of subsidy paid out in recent years. As of 2015, this is not an approved project because Council has not finalized the route design and there is no approved Environmental Assessment. Toronto has been accumulating revenue from a dedicated SSE tax in its accounts, but this does not show up in the TTC financial statements. Maybe once we convert completely to PRESTO, we’ll be able to find out from where the users of the TTC actually come from. Maybe even get the 905ers (or Ontario) to cough up more of the operating subsidy. Steve: Who pays for the TTC? I don’t pay fares but I still pay for the TTC through the taxes that I pay. Steve: As do we all. Taxes pay for many services whether we use them or not, but they’re there for everyone. @wklis – No, 905ers will not be coughing up any operating subsidies for Toronto any more than Toronto is willing to cough up operating subsidies for 905ers which Toronto isn’t. You are living in a fantasy world. Steve: Actually, until fairly recently, about half of a levy on municipalities that helped pay for GO Transit was paid by Toronto. @wklis – Fine, we will cough up operating subsidies for Toronto if Toronto agrees to subsidise Brampton Transit. @Jim — Brampton transit users pays 46% out of the farebox, which means 54% comes from Brampton’s property taxes. Toronto transit users pays 73% out of the farebox, which means 27% comes from Toronto’s property taxes. If Ontario (which includes Toronto and Brampton) pays even half, or 13%, towards both Brampton, Toronto, and the other cities, I would agree with that. I am a socialist who believes in redistribution and am proud to pay my taxes. I know that some of my tax contribution ends up in Brampton subsidising transit or paying for services I do not use but, nonetheless, remain proud to pay those taxes. However, it makes me hot under the collar, when Toronto asks for the higher levels of government to invest in Toronto, and those who are benefitting from my contribution resent my City from getting our share of our own dollars. This is very unfair. It doesn’t cause me to waver in my core beliefs. However, I want to state loud and clear – when Toronto asks for higher levels of government to invest in Toronto, there is no subsidy from anywhere else. It is an investment by our governments in the engine that drives our province and country and it is funded from the amount that is raised in Toronto. There is still lots left over to invest elsewhere. Once we have an affordable single pass that “fits all” public transit realms then this conversation can & should take place. But it would be to review the subsidies both Toronto and the 905’rs who already pay big money in other form of transit to get to the TTC. Can’t have it both ways. If you’re going to be Ontario’s major economic hub there is a trade off to get people here from all over. But the value that having someone from outside conduct business within the City should also be factored in as it’s not so cut and dry. But I agree Ontario should certainly pay their fair share. Whatever that may be. When Toronto asks for higher levels of government to invest in Toronto, there is no subsidy from anywhere else. Seriously, what are you smoking? Toronto is in a ‘have-not’ province and so other provinces are subsidising Toronto when they should not have to. The engine that drives our province and country and it is funded from the amount that is raised in Toronto. Seriously, what are you drinking? Engine of the country in a ‘have-not’ province? Perhaps Ontario would be a ‘have’ province if Toronto were the engine of the country? If God forbid an asteroid destroys Toronto tomorrow, the rest of the country would still keep running something which would not be possible if Toronto were the engine. The fact is that no one city or province is the engine and everyone has their own engines. Sorry about the language Steve but I believe that you actually get much worse language than mine as plethora of trolls abound. Steve: Given your handle, I must say that the day when Alberta falls to “have not” status with the demise of the oil industry will bring a certain wry sense of glee to Easterners tired of the arrogance. That’s a very blinkered view, of course, but your attitude is just the sort of thing that pisses off potential allies. Drivers should not have to pay for the TTC through gas taxes any more than a levy should be placed on TTC fares to fund road construction/repair – the roads that TTC buses and streetcars use and yet no funding for roads from the TTC budget. Status quo is very unfair and we need a revolt in this city. If the TTC agrees to cough up operating subsidy for YRT/VIVA, then we would be willing to have a discussion on your proposal. 905ers already subsidise the TTC through our fares and taxes and asking us for more just shows pure greed. Fine, we will cough up operating subsidies for Toronto if Toronto agrees to subsidise Brampton Transit. BT/Zum has a breakdown around 45% farebox, 46% property taxes, and 9% gas tax and a total of $335M. TTC has a breakdown around 65% farebox, 30% property taxes, and 5% gas tax and a total of $1698M. Let’s say Brampton agreed to pay 5% of the TTC operating budget in return for Toronto paying 50%. That’s means Toronto paying $167.7M or $60.11 per person and Brampton paying $84.88M or $162.01 per person. The balancing point tax-wise would be Toronto paying 50% and Brampton paying 1.9%. That seems like an arrangement that’s just going to make everyone unhappy. 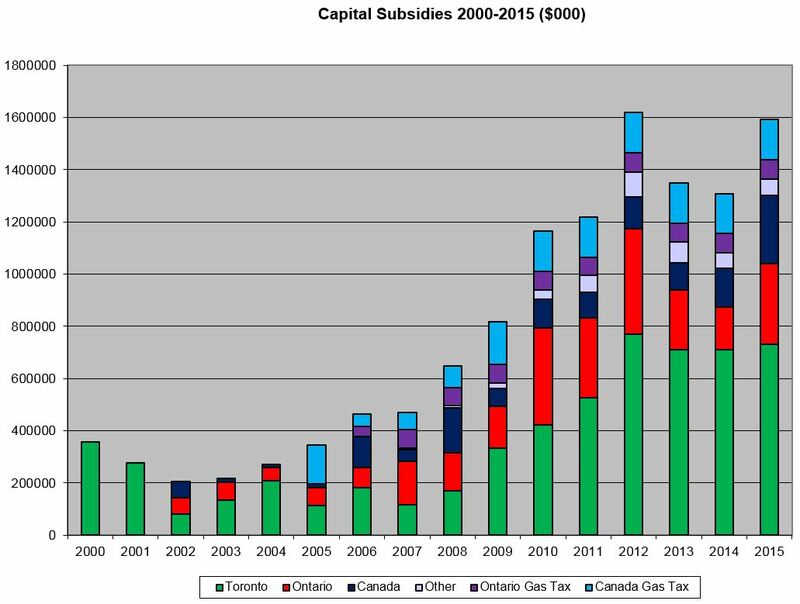 Toronto is in a ‘have-not’ province and so other provinces are subsidising Toronto when they should not have to. Ontario was only a ‘have-not’ province due to the oil boom. Of the $17,341M in equalization in 2015-16, Ontario received $2,363M. In 2016-17, Ontario will get $2,304M of $17,880M. However, Ontario still sends more money to the feds than it receives in return. Beyond that, Ontario qualified for Equalization from 2009-10 onwards due to the limited relative strength of its economy when compared to the other provinces. If you want to take Ontario off the receiving list, then the best option is a higher rate of economic growth, which is dominated by economic growth of Toronto and the GTA. As equalization payments are averaged over three years, Alberta will soon be in the position of paying equalization while being below the national average. If you want to complain about have-nots, the territories have a combined population of 120K and will receive $3,767M in federal subsidy. Actually, the TTC does pay for road repairs as far as streetcar rehabilitation and intersection crossings when it’s in a separated ROW. Drivers benefit from the TTC operating by having less congestion, so there should be some contribution. The majority of road expansions and street repairs are paid out of general funds, so everyone is paying for them. The status quo is very unfair, but in the opposite direction that you are considering. YRT/VIVA have both higher fares and a lower fare box revenue to budget ratio than TTC because it is subsidizing rural routes in Newmarket, Georgina, Aurora, Stouffville, etc. For example, in 2012 a budget of 22.5M trips on 1.16M revenue vehicle-hours (19.41 trips per hour) and 2010 20.1M trips on 1.13M (17.95 trips per hour). YRT/VIVA fares pay for 39.6% of the operating costs. $59.8M of $151.2M in 2012. A $0.16 increase in TTC fares could match the YRT/VIVA farebox revenues, while an additional subsidy $1,174M would be needed to reduce the TTC R/C ratio to 39.6%. Sorry to burst Taxpayer’s bubble, but government services are not like ordering à la carte in a restaurant. At the risk of stealing a rant of John Oliver’s on another subject, government services are more like a buffet restaurant. You may complain that their price of $14.99 is unfair because they offer beets and you don’t like and won’t eat beets, but that is the price everyone pays and each chooses what they like or want. Okay so, I am from Mississauga and while I whole-heartedly disagree to your suggestion, I would agree to put wklis’ proposal for a referendum before the generous people of Mississauga who have been subsidising Toronto for years. Steve: Actually, it’s the other way around, but I am getting tired of this thread. Mississauga New Resident: Okay so, I am from Mississauga and while I whole-heartedly disagree to your suggestion, I would agree to put wklis’ proposal for a referendum before the generous people of Mississauga who have been subsidising Toronto for years. Me: I too with support the referendum as long as Toronto pays for the referendum. I predict that Toronto would be defeated unanimously by the good people of Mississauga and as such would be an embarrassment to Toronto Mayor Ford but I guess that after so many scandals, a little more embarrassment won’t make much difference. Steve: It is so nice to see that the news that it’s Mayor Tory now, and that Rob Ford has passed on to the great crack haven in the sky, has not yet reached you. The pony express may be stuck at Etobicoke Creek. York Region residents currently pay double fare for travelling a short distance within our own sovereign territory. For example, a few blocks on Steeles bus and say a few blocks on Yonge bus north of Steeles. Given this structural unfairness, I am outraged by wklis’ suggestion that we further subsidise the TTC. Steve: Your “sovereign territory”? You can stay on the north side of Steeles for all I care. A much more rational question would be to ask why Queen’s Park insists on coming up with fare savings for the 905 at the expense of higher fares inside the 416. Better subsidies, a truly “regional” need, would allow the sort of inequity you complain of to be eliminated. But no, they just want a cash grab on Toronto. “Who pays for Toronto transit? (More than any other city in North America,) Toronto itself, particularly the actual riders” – cue ridiculous complaints that Toronto and TTC riders should also be funding other transit / taking even less tax dollars / are somehow ripping off everyone else in the GTA. And all of this despite, on every complaint thus written, the opposite being true and being factually proven in some of the responses! (Toronto / the TTC are always net “negative” i.e. we contribute more to provincial equalization than we receive, subsidize Mississauga’s and York’s and Brampton’s transit more than they do us, etc). Kudos to Steve for a great article and the few commenters on the side of reason for putting up with this with more patience than I’d have! Speaking of the actual article, I’m on the fence over the newly invigorated operating subsidies. Yes, it’s nice to see Tory bringing them up – we finally broke over 400 – but I worry both about it’s effect on higher levels of government and the relative lack of a capital increase. In other words, while it’s great that the city is throwing more funding to operations, it gives the provincial and federal governments an excuse to keep their portion at the pitifully low levels they already are. And what about the (sorely needed) capital expenses, which have been stagnant for almost 4 years? Steve: The problems with capital spending and future budgets are one of the topics covered in the City Manager’s report presented on May 24 to Executive Committee. I will be covering this in a separate article soon. No disrespect but do some research before you make your baseless claims. Fares in York Region are much higher than the TTC for example. First the Toronto-Scarborough civil war and now don’t start 905 vs 416 because 905 has you surrounded and outnumbered. Indeed 905 > 416. Steve: You completely miss the point. Fares in York Region, not to mention per rider subsidies, are higher in York than Toronto because there are so few riders. If Queen’s Park wants to even out the cost of transit across the region, it should not expect Toronto riders to pay the price any more than you would expect to pay for Toronto’s transit. As for Toronto being “surrounded and outnumbered”, that comments shows just the sort of political and social attitude that utterly voids any claim you might have to “reasonable” argument. If the 905 is so big, why haven’t you managed to build a much bigger transit system and operate it at more attractive fares? You cannot blame the folks “downtown” (ie south of Steeles) forever. This is an interesting report [from the Fraser Institute], though it is a bit dated. Table 2 is particularly interesting. One caveat, for all our public spirited 905 contributors, the Halton, York and Peel payouts are not going to Toronto as Toronto is a net contributor to the province as well. Also, as we have progressive taxation, it is also useful to look at the Average Household Income portion of the Table for those counties. Look at the fundamentally different perspectives here and then imagine Metrolinx trying to wrangle an idea that will fall under the heading of “revenue neutral” “fare integration”. YRT has a high-fare, high-subsidy system, but lower farebox recovery. MiWay has $3-fares with a higher subsidy, but seniors are more expensive than on the TTC. If “weight” is done by system, then the 905 has more votes, but if done by population, ridership or revenue, then Toronto comes out ahead. It’s the eternal question of umland vs hinderland; city vs rural. We need a rationalized system that allows each system to set their own balancing point while provincial/federal funding is proportional (to a combination of area, ridership, and population). YRT has a growing core ridership, but has to support a large hinterland. MiWay is a mature system that’s mostly going to see intensification, but not more geographical expansion (unless MiWay and Zum merge to form Peel RT). This same argument rolls downhill. In Peel, you have Caledon vs Mississauga/Brampton, and in York, you have Aurora/East Gwillimbury/Georgina/King vs Vaughan/Markham/Richmond Hill with Newmarket/Whtichurch-Stouffville somewhere in the middle. We need a funding formula that lets everyone gain. For Operating Costs, something like (see above for complications): 10% federal subsidy, 15% provincial subsidy, and 75% from the municipality through general taxes and farebox revenue. In the end, this means York and Peel chipping in more and the TTC receiving more back (all still being net contributors, but the scales slightly less tilted against Toronto). I am a bit biased because I almost always agree with you. However, I can confidently state that there is NOOOOOOBODY (as Mel would say) who has done “some research” more than you. Senator Daniel Patrick Moynahan said (and I paraphrase) “you are entitled to your own opinion, but not your own set of facts”. It is legitimate for some to disagree with your conclusions Steve, but it is entirely unacceptable to suggest that you have not taken the trouble to investigate the facts. I am, as always, in awe at the depth of your research and knowledge. Steve: Many thanks, but awe is not required. It comes of following a portfolio for a long time. As for the “facts”, I try to get those right, and it pains me greatly when professionals who should know better make them up or simply “don’t know”. How much did the new fare gates cost? Because they are poorly designed and people just walk in behind other people and sometimes as many three people on one fare. I am usually honest but when I see other people screwing the system, I feel like a fool to be paying and so I decided that I am going to be smart like them and not a fool anymore. Steve: Of the many remarks about “free rides” I have deleted, this one at least speaks to a real problem: the reliability of the new fare gates. All in, I think they’re around $60 million, part of which is paid for by Presto as part of their rollout, and part by the TTC as an upgrade to their “legacy” equipment. Steve, I pass through Wellesley weekly. I’ve noticed that since the new Presto fare gates opened a few weeks ago one of the wider wheelchair accessible gates has been out of order, with an orange construction cone in front of it….hope this does not reflect on their future reliability. I can’t believe that “opportunity” equals honesty. If there were no fare gates at all I would still pay. I am disappointed that the bad example of others would cause an different person to steal. Today at Finch station, they were studying “an honour system” and though the collectors were working, they were just standing and not collecting fares and supervisors and customer service agents were there and I was told that they were studying “an honour system” and I could pay in the fare collection box but I did not have to and so I did NOT pay. I specifically asked if I had to pay and I was told that I am expected to pay but that I don’t have to and if I don’t have to, then I won’t as while I am honourable man myself, I am NOT a fool. Thanks for the free ride TTC and looking forward to participating in more honour studies as it’s best that the money from the studies go to customer savings rather than rich consultants. One of the last times the TTC was able to turn a profit was in the ’60s. Closer to the ’70s the TTC was mandated to serve Metro’s suburbs, more known as the inner suburbs now, and also at the same time also happened to be handed a 75% operating and capital subsidy from the province. Once the 75% provincial subsidy was yanked by the Harris provincial government, the TTC was still expected to soldier on. Even then either way one looks at it trying to get any mass transit operator to serve suburban automobile oriented development in the suburbs is just going to consume more resources. It was Harris among others who would try to stick it to downtown Toronto to be more efficient when of course many of the suburban automobile oriented development communities he prospered in probably had something more to learn about efficiency, just as a handful of downtown surface routes could probably carry more passengers than most of GO Transit. Steve: The TTC never received a 75% operating subsidy from Queen’s Park. The Davis formula was 1/2 of the operating deficit which was 1/3 of the budget. As for the capital side, it was 75% only for “rapid transit”, otherwise 50%. When the gas prices went up, TTC used that as an excuse to raise fares. When the gas prices were at their historic lows (inflation adjusted), TTC still raised fares. In the past, TTC also cited lack of federal subsidy to raise fares. And now that the gas prices are still very low and federal government has just provided TTC with almost a billion dollars of extra funding, TTC has no plans of reducing fares and I have also heard some talk of yet another fare increase from January 1st, 2017. Such greed exhibited by the TTC only encourages otherwise honest people to ride free on the TTC. We are told that if the TTC were privatised, then we will be eaten alive by the greed of the privatised TTC but we are already being eaten alive by the greed of a public TTC. Full Disclosure: I used to pay my fares honestly but no more. Steve: The money coming from the Feds isn’t here yet, and it will be capital dollars not an operating subsidy. If you want to complain about fares going up, you might turn to that nice Mr. Tory who was happy to get lots of photos taken when he added money to the TTC budget in 2015, but not so many when he took a good chunk away again in 2016. I am honourable man myself, I am NOT a fool. Sorry, Bruce, you got that one backwards. Assuming you are dishonourable enough to steal every time someone isn’t explicitly watching you, it would have been in your best interest long-term to pay while the “honour system” study was underway. As you didn’t take the honourable route and pay, there is a lower likelihood that the fare recovery is at a sufficient level to warrant wider implementation. Such greed exhibited by the TTC only encourages otherwise honest people to ride free on the TTC. We are told that if the TTC were privatised, then we will be eaten alive by the greed of the privatised TTC but we are already being eaten alive by the greed of a public TTC. And Lucifer was an otherwise wise and beautiful angel. The TTC does convolute itself to justify price increases, when they should just say “inflation”. Looking at January 1990 to December 2015, in Ontario the cost of operating a private passenger vehicle has risen 235% while TTC fares have risen 250%. So that’s a 0.25% increase over inflation per year. Very greedy indeed, I now understand why so many drivers now feel justified in stealing gas when they fill-up. @Mapleson – Regarding my long-term interest, I did pretend to put a token in thus fooling the TTC staff doing the study. @Bruce J – Yes, I’m sure they are completely fooled by pantomime and never actually count the tokens/cash deposited. I’d normally start by asking if you’re really that thick, but I feel like the question is redundant. Unless you’re dropping high-quality fake tokens (which is a different problem), there’s only one person being fooled. Steve: OK guys. Enough of this.